RTB: Sox option Lars Anderson to AAA; Cook recalled? Following the Sox 5-3 loss to the A's tonight, Ben Cherington told reporters that Lars Anderson was being sent back down to AAA. Anderson came up in a big spot with the tying runs on base in the 9th and struck out on a ball not even close to the strike zone. Something tells me that even if Anderson did get a hit in that spot, he would still be packing his bags for Pawtucket due to the Aaron Cook situation. As of today, Aaron Cook can opt out of his deal and become a free agent, although it seems that will not happen and he will join the Red Sox as early as tomorrow or Thursday. The big question is, what are the Sox going to do with him? Cook is 3-0 with a 1.89 ERA in 33.1 IP for Pawtucket this season. Is he going to be put in the bullpen? Or are they going to go with a six-man rotation for a while? While Cook would rather stay as a starter, he would certainly be a welcome addition to a sketchy bullpen. It isn't out of the question to go with a six-man rotation. Following tomorrow night's game, the Sox will prepare for a 20-games-in-20-days stretch. Having a six-man rotation for this stretch could help keep all of the starters fresh and give each of them one extra day of rest in between starts. It would also be a great time for evaluation and figure out roles for the staff. If Bard continues to pitch well as a starter through this stretch of games, the bullpen chatter has to stop. If Doubront struggles as he did tonight, maybe you throw him in the bullpen and give Cook a shot in the five-man rotation. And don't forget about the return of Daisuke Matsuzaka, who is expected to return to the Sox at the end of May. 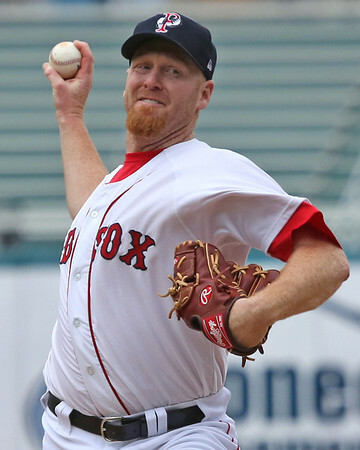 Needless to say, every starter (with the exception of Lester and Beckett), is fighting for their spot in the rotation. With the promising production from Cook, and the return of Daisuke, a few bad starts in a row could mean a trip to the 'pen, or even AAA.